Three years ago, on a solo mission to assist patients in El Cercado, Dominican Republic, Dr. Ernest Vomero faced unsanitary conditions, a lack of electricity, and no running water. But the tough circumstances didn’t hold back Vomero, a Huntington-based lung specialist, who completed that trip with success, and returned to the village again this year for a second stint of healing. To help heal those affected by that chaos, Vomero sought donations of medical supplies and equipment before embarking on his first, November 2013 trip. He ended up supplying $300,000 worth of supplies and equipment like medication and surgical instruments to the village’s hospital, Hospital Municipal El Cercado. He also donated six microscopes to a local high school for use in its chemistry and biology classes. 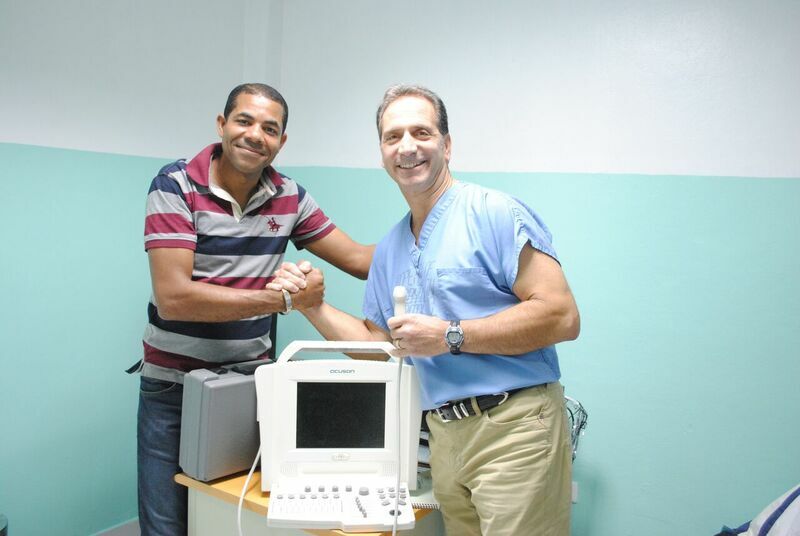 Vomero, a graduate of George Washington University School of Medicine, who opened his Huntington-based medical office 1989, spent a week in the village during the first solo mission and treated 100 patients. He ventured back last month, and saw a few familiar faces. For his second mission Vomero tagged along with a missionary group from Syosset-based St. Edward’s the Confessor Roman Catholic Church. He was stationed in El Cercado from Nov. 8-13, spending three, 12-hour days at the hospital and treating 60 patients, some of whom visited him again for a follow up. Vomero said he was also pleasantly surprised to see that the hospital had been renovated since his first trek. There were painted walls, new floors, running water and working bathrooms. He also supplied the newly-renovated hospital with some new equipment, including a portable ultrasound machine that he no longer required due to his practice’s recent partnership with Northwell Health. Vomero gave a pair of lectures to village doctors. With 10-12 doctors present at each lecture, Vomero discussed current techniques and treatments for chronic obstructive pulmonary disease, and asthma. Vomero said he’s always felt the need to do some type of medical charity work. Along with his trips to the Dominican Republic, he’s also the medical director for the Marty Lyons Foundation, a nonprofit that fulfills wishes for terminally ill children, and has been on the foundation’s board for 25 years. The idea to head to the Dominican Republic originated from a missionary priest Vomero met at Our Lady Queen of Martyrs Church in Centerport. While the trips have been tough, Vomero said they’ve been worth it. And he’s brought that notion of charity home to share with his family. His wife and four children are each involved in charity work. Vomero said he hopes to establish a long-term relationship between the El Cercado and Northwell. He said such a partnership could offer opportunities for students at the Zucker School of Medicine at Hofstra/Northwell, and possibly help El Cercado patients through telemedicine, assisting El Cercado doctors in viewing patient records or seeing patients through online video.